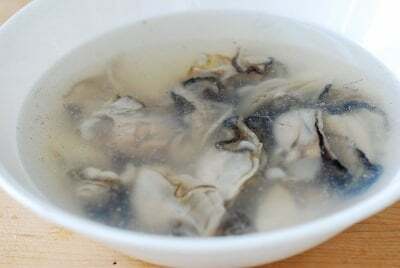 Oysters (gul, 굴) are widely used in Korean cuisine. 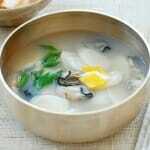 They are delicious with bossam, and in so many other dishes such as jjigae, hot pot, pajeon, rice, kimchi, musaengchae, etc. Oysters take these dishes to the next level of flavor. Oysters are also great in soups! 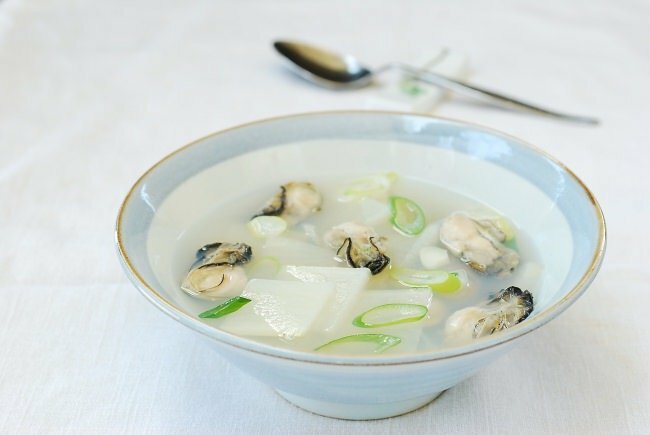 Although there are many minor variations, Korean oyster soups (gulguk, 굴국) are simple, refreshingly clear, and incredibly briny! Due to their high nutritional value, oysters are often called “the milk of the sea”. 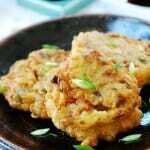 They contain several essential vitamins and minerals including protein, iron, omega 3 fatty acids, calcium, and zinc. See more. 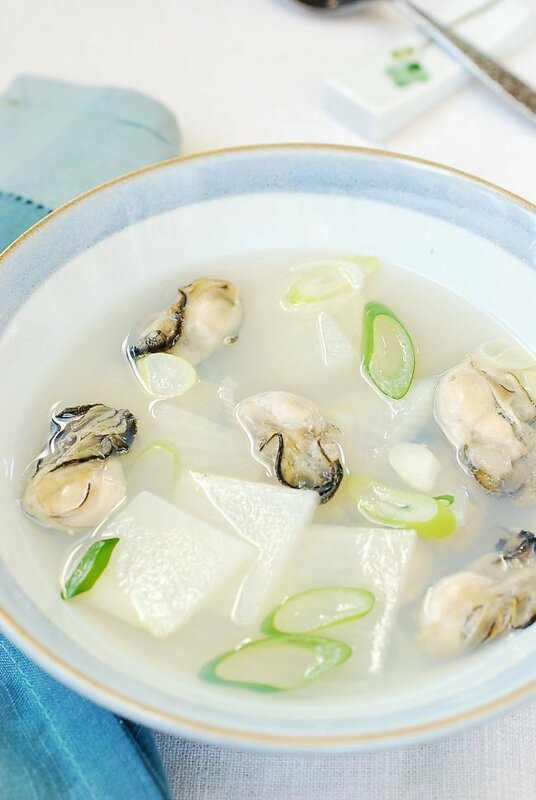 In Korea, fresh oysters are plentiful and relatively inexpensive, especially during the cold months when oysters are in season. Around here, fresh oysters are quite pricey and sometimes hard to find. I usually get jarred oysters in the refrigerated section of grocery stores, or sometimes resort to frozen ones in Korean markets. Interestingly, according to this photo essay by Bloomberg, The World of Oysters: How South Korea’s Sea Farms Feed Global Appetites, Korea is the World’s second largest exporter of oysters. Be sure to check out the essay. The photos are amazing! 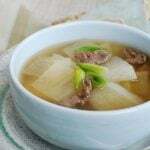 As far as making this soup, simple is best! This recipe uses 2 main ingredients — oysters and radish. 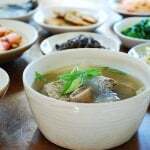 The oysters impart a strong briny flavor, so you don’t need to use a flavorful broth, such as anchovy broth, as a soup base. I simply add a small piece of dried kelp (dashima) to boost umami, and use salt to season and highlight the briny flavor of the oysters. You can use a little bit of soup soy sauce if you want. The radish makes the soup even more refreshing. 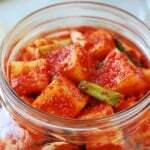 Some napa cabbage and/or soybean sprouts (kongnamul) can be good additions as well. 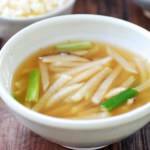 You can even add some tofu if you want to make the soup a bit more substantial. 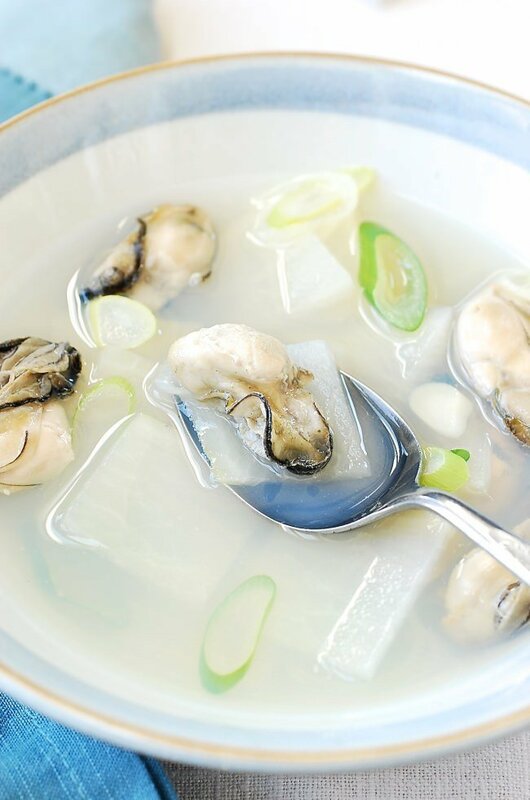 Simple, refreshingly clear, and briny soup made with oysters! Clean the oysters by gently swishing around in salted water. Drain. Rinse again in clean water and drain again. 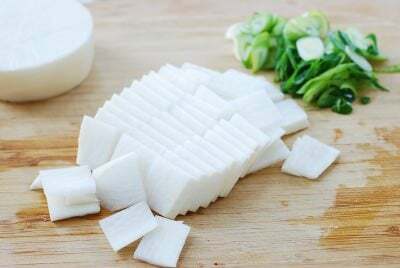 Cut the radish into thin, bite size pieces (about 1-inch square, 1/4-inch thick). Thinly slice the scallions crosswise and slightly diagonally. Add 6 cups of water, the radish and optional dried kelp to a medium size pot. Bring it to a boil over high heat. 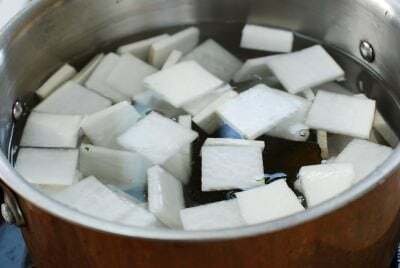 Reduce the heat to medium high, and cook until the radish is softened, about 5 minutes. Remove the kelp if used, and drop the oysters in. Add the garlic, and season with salt (about 1 teaspoon) and pepper to taste. Cook for another minute after the soup comes to a boil again. Do not overcook oysters. Remove the scum. Drop the scallions in right before turning off the heat. First, thank you for your recipes! I use your recipes to cook homemade meals for my parents, who can no longer cook. 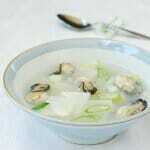 I’d like to make them the oyster soup and the potato soup to take home. Would these do well in the freezer? aww that’s nice to hear you make your parents Korean meals. The potato soup has tofu in it, and the tofu may change in texture when frozen. I haven’t tried to freeze the oyster soup, but I think it should be fine. Sorry I can’t give you a definite answer. Hope you try it and let me know. Thanks. Hello! I’m in love with oysters. I live in Maryland so oysters are plentiful! Can I use a can of fresh oysters? Or do I need to buy whole oysters and shuck them myself? No you don’t need to shuck them yourself for this recipe. 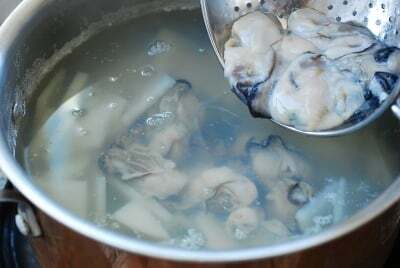 You can use canned/jarred fresh oysters. what are good accompaniment dishes? 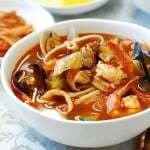 i would love to prepare a complete table for my family, and i’m struggling to figure out what dishes would compliment this soup versus overpowering it.